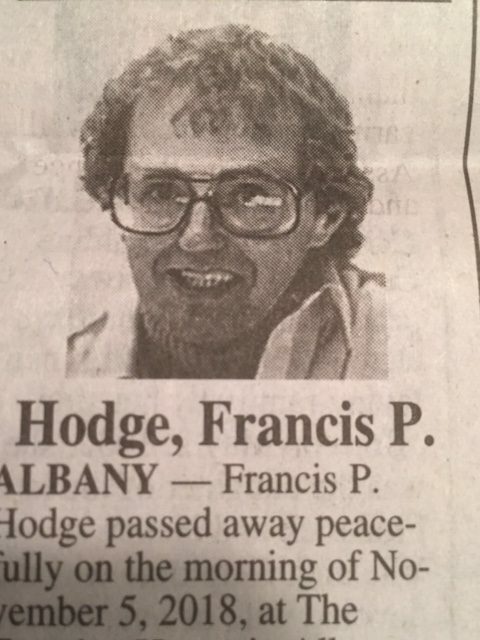 When I learned that Frank Hodge had died, I immediately thought of all the people whose lives he had touched. Frank had that indelible knack. We quickly became entangled in his fiendish web of book people. 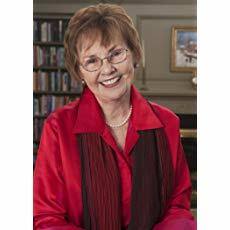 Writers, teachers, readers, librarians: Hodge-Podgers, all. Somehow we were all mixed up in this beautiful community together. And it was fun. Full of laughter. Impromptu read-alouds. Mischievous zingers. Kindness. Frank made us feel not only validated, but gloriously celebrated, as if our work really, really mattered. You don’t see that much these days. But for Frank, it was like air. It was breathing. He represented something that feels nearly lost today, the way we hear stories about editor Ursula Nordstrom and think, oh gosh, that must have been something. I decided to reach out to different folks who knew Frank, to see if they would like to share a few words, a memory, a photo, something. The response was overwhelming but not surprising. Please forgive me if I failed to connect with you. Feel free to leave a comment. 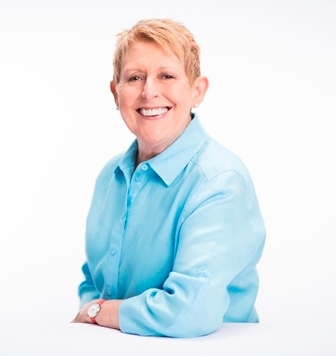 When I was a young, aspiring author who didn’t believe in herself (that could still describe me, except for the “young” part), I came home to see my answering machine blinking. It was a long, effusive, incredibly affirming message from Frank Hodge — Frank Hodge! — telling me how much he loved my third book Weasel. I listened to it over and over again, and couldn’t bring myself to erase it. Eventually I had to replace that machine. But Frank’s words made all the difference in my brain and in my career. Those were heady days; Frank’s conferences were so full of joy and enthusiasm and positivity about ideas and books and the power of literature. I miss that, and I will miss him. Frank changed my American life and brought me to the attention of thousands of readers who would never have otherwise known me. I’ve been feeling lost and miserable since he died. I’m all by myself, as it were, down here in Australia, with a massive lump in my throat and no one to hug, i.e. no one who knew Frank. I adored Frank. He was one of the world’s extraordinary people: outrageous, brilliant, and incredibly generous, occasionally difficult, with a wicked sense of humour and a love of salacious gossip—and a distaste for vegetables of any colour, much to my endless horror. Our conversations went far into the night but I never had to take my make-up off afterwards because I’d already cried it off, with laughter. Reader’s Digest used to run a regular feature called “My Most Unforgettable Character.” For me, that would be Frank Hodge, who was a great force for good and joy in the world of children’s books. As anyone who ever attended one can testify, Frank’s conferences were one-of-a-kind events. An image that I still carry with me –- something I saw on numerous occasions –- is that of coming into the book area after Frank had done one of his presentations and not being able to see the sales tables at all because the throng of teachers and librarians trying to get at them was four deep. That was how good he was at getting people excited about books. His conferences were always themed, and there is one that will always remain my favorite. I had been hanging around with him in the store on Lark Street, chatting about one thing and another, when we got to talking about how much kids loved scary stories. Frank promptly decided that he should focus a conference around that, and thus was “BOO!” born. An entire conference devoted to scary stories. How delicious! Without informing him of what I had in mind, prior to my presentation I dressed up as my “half mad twin brother, Igor.” When he introduced me this shambling, long-bearded, fur-coated hunchback came down the center aisle. He reacted perfectly, and I was never sure whether I had actually fooled him or he was going along with the fun. When I got up beside him I pulled aside my fake beard and said, “It’s me, Bruce!” We were still laughing about it years later. Frank showed me innumerable kindnesses when I was just getting started, as I know he did to countless other writers and illustrators. His conferences were one of a kind –- and so was he. We will not see his like again. 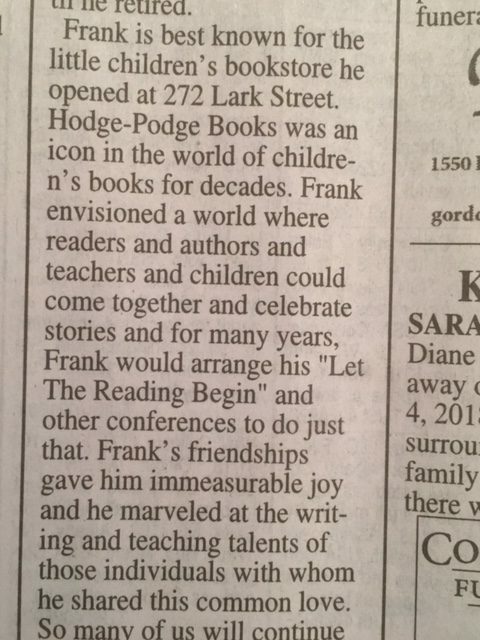 The field of children’s literature is filled with brilliant, generous people, none more so than Frank Hodge. He helped countless readers to find the perfect book, and countless authors (including me) to find their way in the world of publishing. He was warm, witty, and a raconteur of the highest order. Frank had a big heart, although his love didn’t extend to technology. For years I was his tech support guy, and he always seemed to need an awful lot of support. It took me years to finally understand why; Frank preferred it when his computer was broken. It was easy to drop by the store. I worked nearby, and told Frank to call whenever he had an issue, but he stubbornly refused to pick up the phone. Whenever something would go wrong—say, he forgot the icon to get back into his email inbox—he would sit down and write me a letter, then shut down his computer. Days would pass. To make sure I couldn’t reply too quickly, Frank made the letters difficult to read. One letter was typed on the back of a paper napkin from Price Chopper. Another was typed in random chunks, scattered at odd angles across the page. His masterpiece was a long strip of paper tape with sentences that started and ended halfway through. It took the better part of an afternoon to figure that one out. 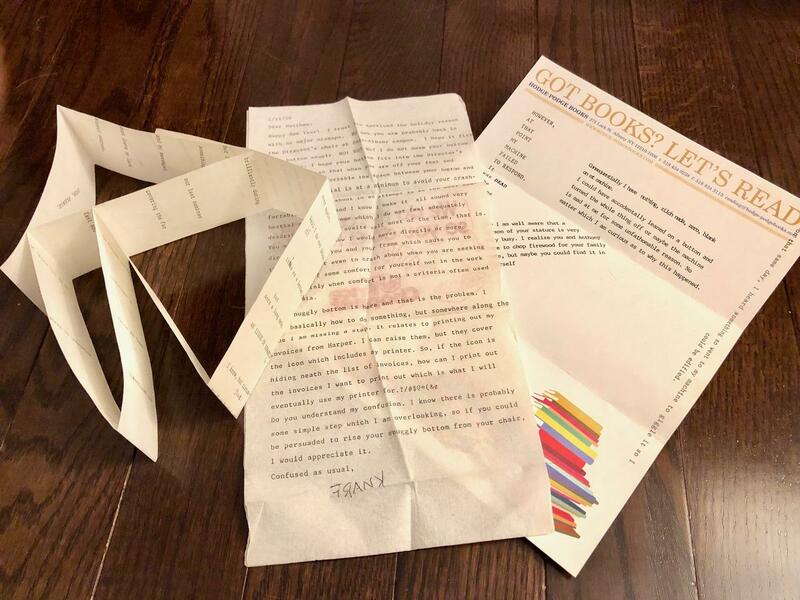 There was nothing quite like a Frank Hodge letter, just as there was nothing like a Frank Hodge bookstore, conference, or conversation. I’m blessed I could experience them all. Books, his teaching, the festivals he put together. For so many years it seemed as if his energy was everywhere in the world of children’s literature. One story that I remember about Frank is an incident he told me about when he had to have surgery some years back. But the nurse was insistent, not realizing she was reading the wrong chart. At that point in the story, Frank started laughing. “What happened next?” I asked him. And then he laughed even harder! I first met Frank when I was waiting tables at his favorite spot. When Frank learned I was studying to be an English teacher, he invited me to Hodge-Podge to enjoy some of the new books. I was so intimidated that it took me almost two years to gather the gumption to take him up on his offer. I was terrified that Frank might wonder what I thought of a book and I had no confidence in my ability to recognize or articulate my thoughts. On that first visit, Frank offered me a pile of books and ordered us lunch. We sat in his backyard sanctuary and by the time I left six hours later, I had a second stack of books to read and a new job helping to ship books all over creation. Almost thirty years later, my friendship with Frank remains one of the singular defining ingredients of my life. Visits with Frank always morphed into adventures and his endless trove of stories was, reliably, equal parts mirth and tutorial. Like the books and the authors Frank championed, he was a master at imparting insight and emoting compassion while disarming with humor. He never did overcome his fear that his own writing might not measure up, but I was blessed with countless chapters of his story and their lessons have helped shape me. These last two years, I struggled to visit Frank as often as I should have but when I could muster the courage, Frank would do his best to ask after the goings on in my world and he never missed an opportunity to tease me mercilessly, somehow stealing a narrow path through the closing fog to reprise his role, for another moment, as the perennial rascal prince. One quick story — Frank came to speak at my school (I was a school librarian in Schenectady and teaching at Woodlawn school at the time) and of course that required picking him up at the bookstore in Albany since he didn’t drive. We were talking in the car on the way to school and he was surprisingly unsure about how effective he would be working with the kids, especially at the middle school level. I assured him that they would love him. He spent the day sharing books with classes and had the kids, grades K-8, enthralled as only he could do. 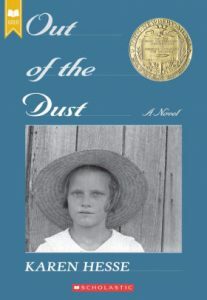 A few weeks later, a mother stopped by the library to tell me that she had never been able to get her 7th grade son to read but after that day with Frank, he wanted her to get him several of the books Frank shared. She did and said he hadn’t stopped reading ever since — she even caught him reading with a flashlight under the covers when he should have been sleeping! She was almost in tears telling me this and Frank was so pleased when I shared that story with him. Frank had the chutzpah to dig up my home phone number back in 1992 and call me after reading my second book, Letters from Rifka. I remember sitting on the stairs in my tiny old house listening to this complete stranger lavishly praise my writing while my children clamored in the background, longing for dinner. He flattered me for over an hour during that first phone call! When he was not complimenting my work we were discussing literature and writing and favorite books and authors. How could I help but fall in love with Frank. He championed not only my work, but the work of so many. He was funny and wry and sly and ironic and sensitive and bright and brave and a beloved friend to writers and artists everywhere. I will always be grateful to Frank and his early support of my work. But also his support of so many others struggling to find an audience for their unique and compelling voices. Frank made a difference in the world. He will be missed. Frank was a wonderful guy. He heard of me when I published my first book. 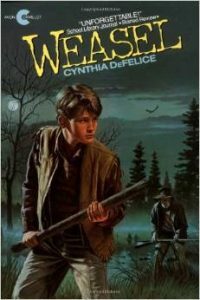 He said that he “wanted to meet a local boy who made it in the children’s book business.” He invited to his store, and to his famous “Let the Reading Begin” conference, where I met a lot of great people. I’m sad to hear of his passing. Eileen and I have long been happy and proud to count ourselves among the first of Frank’s anointed “Hodge-Podgers.” We have little pins to prove it. Personally, Frank was there at the birth of my first novel. I remember getting a call at work (somehow he’d tracked me down) and hearing him say nice things and wondering, Who is this guy? Next thing I knew we were having dinner in Albany and Lark St. had already begun to sound magical. 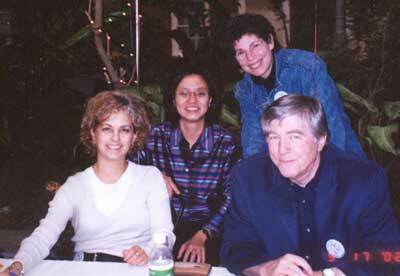 Frank’s “Newbery Corner,” a photo taken at one of his conferences: Kate DiCamillo, Linda Sue Park, Karen Hesse, and Jerry Spinelli. Frank Hodge’s conference was the very first one I was ever invited to. It must have been 2001; I had two books published with a third coming out…. That ‘third book’ was A Single Shard, which won the Newbery Medal in 2002. Frank invited me back again that year, which is when the photo was taken. I don’t seem to have a photo of Frank and me together, which I sorely regret. 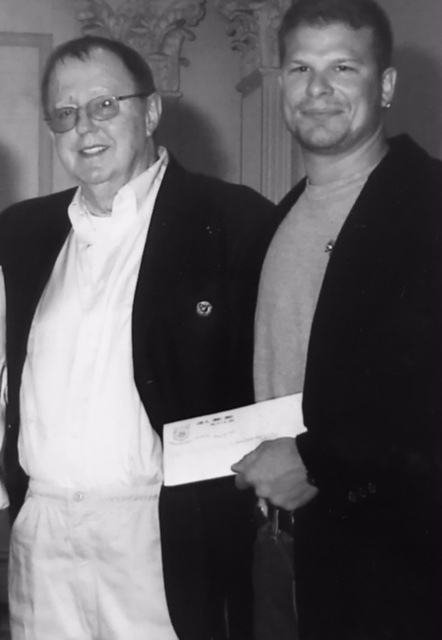 It meant so much to me to be invited to speak at that conference so early in my career, and I will always be grateful to Frank for that boost. One night, at the beginning of our friendship, Frank introduces himself and asks me to speak to his class. Frank, a legend; I a new writer, unsure of myself. How does he know this? Somehow he does, somehow I speak in his class, not once, but whenever he asks me. We sit in his backyard one lovely summer afternoon talking about books and writers, and rarely, but sometimes, we disagree. I close my eyes, thinking. Is he ever wrong? I learn so much from him. I bask in our friendship. 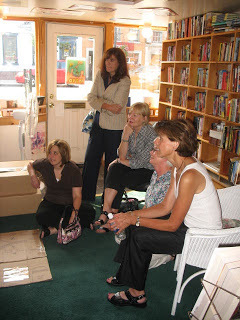 Our family opens a bookstore in Connecticut. On opening day, a bus pulls up in front of the door. Frank has come all the way from Albany bringing friends, bringing readers, to cheer us on. Even now as I write, I think of him. I wonder if he’d think my idea is worthwhile, if the characters come to life. How grateful I am for Frank, lover of books, of story, of friendship. Of the 28 books I’ve written, two of them are dedicated to Frank Hodge. The first time we met, I was an aspiring writer. A friend suggested I introduce myself to a local kidlit luminary she described as a mix between Garrick Ollivander and Winnie the Pooh. I printed my manuscript and headed to Hodge Podge Books, his tiny shop huddled beneath a brownstone on Lark Street. I knew this question carried weight. After all, this man literally ensconced himself with books. Unfortunately, the only characters that popped to mind were Garrick Ollivander and Winnie the Pooh. 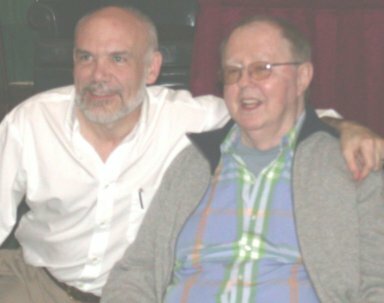 The weeks that followed were the greatest writing lessons of my life, and the beginning of a great relationship with a brilliant mentor and friend. It is always a treat to visit independent bookstores when I visit new cities. 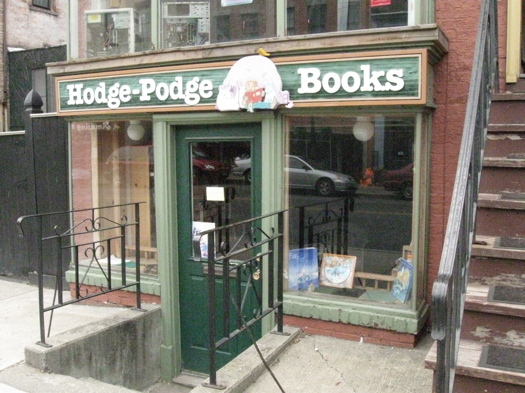 I was fortunate enough to visit Hodge-Podge Books when I visited Albany many years ago. 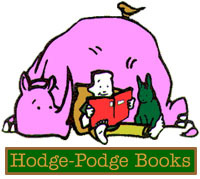 I quickly understood that Hodge-Podge Books was a special place because of Frank Hodge. He not only knew books but he came to know people and make him part of his book community quickly. He was committed to everyone in the book world. 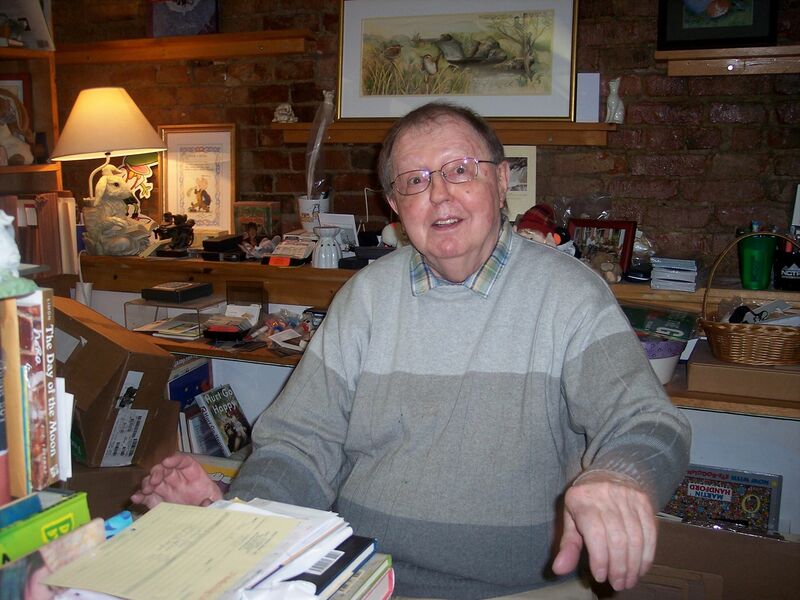 His love of books brought people together and those of us who visited his bookstore that day felt lucky to be a small part of all that he created at Hodge-Podge Books. If only I could find it. That single-spaced two sided letter from Frank; densely woven with appreciation and well-considered comments. Something I could wear like a warm winter scarf. Let’s get the guilt out of the way. I didn’t call or drop a line. I thought there would always be next week. A quick visit to Frank’s store might only last 2 hours. And I made too few trips. 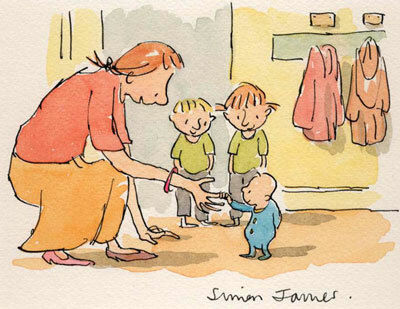 But each one was a master class in the art of picture book making, plus some gossipy asides. Don’t ask me what the gossipy asides were; long forgotten now. The book-lined walls brought the space in closer with just enough room to open a large volume or two. You could explore or, better yet, let Frank find a work, just for you; then Frank-splain the beauty of it. He gathered, curated and matched books to readers. It was like a book/dating site. He built bridges between writers and readers, and grew a community of devotees. I daresay we all made new friends because of Frank. I’ll find it. It made me feel like I might be a real writer and exhorted, encouraged and expected me to carry on. Perhaps you too, earned his approbation. Even if you didn’t get a letter, in the spirit of Frank and his love of the world of children’s literature, carry on! Making books can be a lonesome experience, locked away in a room somewhere, wrestling with projects for months on end, but Frank always knew how to let the sunshine in. A phone call or a letter from Frank was a moment when the pressure lifted off and the very reason why you were struggling with those projects immediately came into sharp focus. His love for what you created always broke through your own moments of despondency or doubt. Often, we talked for several hours on transatlantic calls, joking at each other’s expense. We both enjoyed a deprecating humour that led us to insult each other with as much good nature as humanly possible. 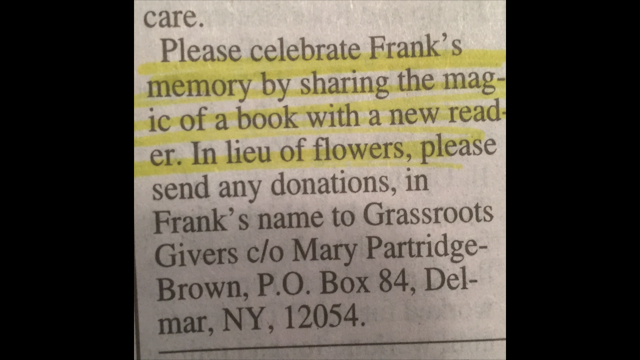 Despite his gift for reaching out to others through books, Frank was a very private man. Perhaps there was a price to pay for his selfless enthusiasm and running the bookshop below his home. I stayed with him many times on my visits to schools around Albany. His personal living quarters above the shop were modest and unpretentious. His bedroom back door led outside to a wooden stairway above the backyard. Frank kept a long piece of string tied to that door, it ran to a safety pin attached to his pillow. This was for Crisis, his beloved cat, to be able to go outside in the night. When sufficiently cold, Frank would wake up and pull the string to swing the door back to be almost shut, until Crisis wandered back in again. This went on all through the year whatever the weather. I can remember trying to sleep in his spare room in the loft wondering why it was so utterly freezing at night. One Winter, I ended up with bronchitis. I could hardly speak. Naturally, I wanted to cancel some school visits, but Frank would hear nothing of it! Frank was a superb presenter of books. He knew how to bring out the best from a text he loved. His warm, inquisitive voice and exquisite timing instantly held audiences spellbound. He held the book in one hand whilst gesturing with the other, like some high priest. He was a master at this, yet completely self-effacing at the same time. He was also openly opinionated; as vocal about the books he didn’t like, as he was about the books he loved. He made every book he read aloud urgent and desirable, one that you simply had to add to your collection. Yet another talent of Frank’s was his gift for the lost art of letter writing. I am very glad I still have the many letters he wrote to me. When I read them they make me laugh, principally because of the way we mercilessly took the mickey out of each other. Nothing was too serious, except our friendship. I will miss him. Boy oh boy, how I hope that, in the blue beyond, somewhere off in the Afterlife, that ultimate hodgepodge, the joyful souls of book lovers and writers are gathered ’round their newly-arrived soul mate, their oh-so-kindred spirit, that of Francis Hodge. At least, I’m trying hard to envision the scene, as well as the time way back in the early 1990s when I first visited Albany, New York’s swellegant little bookstore on Lark Street and met Frank Hodge, its greathearted proprietor. How did I, a shy, newbie author-illustrator from Colorado, come to be there? Because Frank had taken an interest in my first historical picture book, Three Young Pilgrims — talk about Thanksgiving! Little did I know then that the charming, soft-spoken gent with whom I’d shaken hands was one of the truly great champions of books for young readers. What did you want to know and/or need to learn? He could tell you. What lies beyond that ultimate veil? Now, if he could, he’d tell us that too. So we mortals are left to speculate. And read, thank goodness. And imagine — trying to envision, for instance, all of those word lovers who’ve gone on ahead, saved a place for Frank, now taking him by the hand. 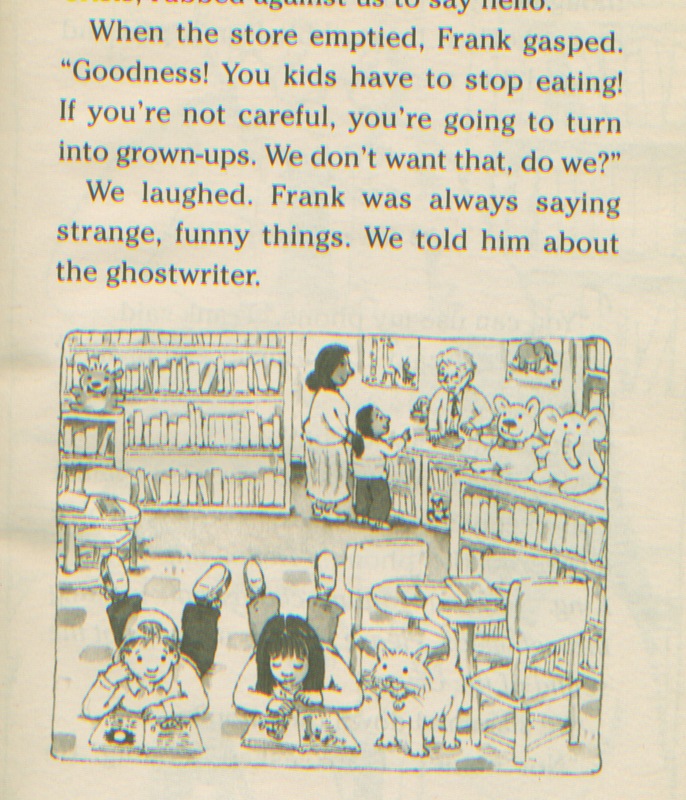 A page from Jigsaw Jones: The Case of the Ghostwriter, featuring Hedgehog Books and an owner named Frank. It even includes his cat, Crisis. I dedicated the @ 2000 book to Frank — but then again, it seems like we all eventually got around to dedicating something to him. Just that kind of guy, I guess. — JP. A Few Frank Facts . . .
Frank’s famous store may have been only 240 square feet –- yet it’s impact was enormous. 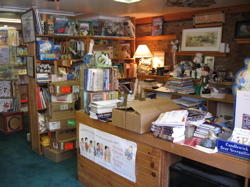 The business hummed along, built around Frank’s close connection with hundreds of teachers and librarians. He enjoyed a lively and jocular relationship with the UPS drivers that daily sprinted in and out the door, burdened with boxes of books. The first “Let the Reading Begin” conference began in 1985 and ran for 17 years. These were always insanely elaborate and over-the-top events. Frank believed authors and illustrators were royalty, and treated them lavishly. Expenses be hanged! After a pause for double-bypass surgery, Frank briefly revived a downsized version of the old conference, but it became too much, even for indefatigable Frank Hodge. The store logo was created by Mark Teague. A lovely tribute to a wonderful man. Thank you for doing this, Jimmy!! The likes of Frank will not pass this way again. No, I think that’s one of the clear takeaways: he was an American original. — JP. As a school librarian, I first met Frank as my professor in a Children’s Lit class at SUNYA. Over the years, Frank became a presenter at my school’s read night and also a dear friend. I spent many hours shopping at Hodge Podge and enjoying the insights of this truly special man. Thank you for putting this beautiful tribute together. So many memories of Frank! Thanks for sharing that, Donna. I appreciate you swinging by my swanky place here in Dot Com. I live around the corner from that store. Imagine it. I left NYC and a job at Scholastic and worked as a freelance writer out of my building on Jay Street. And there was Frank, and Joan — always Joan — packing up boxes. Good memories. We’ve all got ’em, it seems. — JP. This is truly a “Who’s Who” of children’s literature and I feel fortunate to have met and had the priviledge of sharing their first rate works with my students. As a Hodge Podger, I helped Frank with the yearly LRB conferences making name buttons and checking attendees in. For me it was like Christmas, Easter and New Year’s rolled into one! Thank you so much for this amazing, well deserved tribute! It was truly a pleasure to do it, Carol. Thanks for stopping by.